THE construction of the Papua LNG project will begin in 2021 with plans for first cargo in late 2024, according to French operator Total SA. 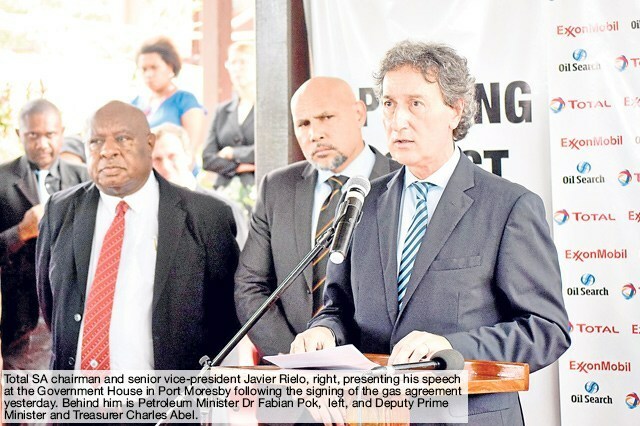 During the signing of the gas agreement in Port Moresby yesterday, chairman and senior vice-president Javier Rielo said the event “triggered a major project milestone”. “With the Papua LNG two trains, along with the third train of the foundation project, PNG will effectively double its LNG production,” he said. He praised Prime Minister Peter O’Neill for leading “tough negotiations, and that we respect”. “It is clear to us that Papua New Guinea has approached discussions with experience and learnings from the foundation project and your other extractive industries, and this is reflected in key elements of the Papua LNG Gas Agreement,” he said. “In our view, a win-win agreement has been successfully achieved. (It) articulates Domestic Market Obligations, third party access to pipelines and other infrastructure. “And we have listened and addressed elements that your government regard as critical to your economy and development. “The agreement responds and features royalties, development levies and introduces a production levy. He said the launching of Front End Engineering and Design (FEED) and then the Final Investment Decision (FID) were scheduled by the end of 2020. “The Papua LNG Project is completing all environmental and social studies including the important SMLI (Social Mapping and Landowner Identification) studies.